British Columbia Historical Federation | The Federation provides a collective voice for its member societies. Are you a Member yet? Join or renew your membership to the BCHF. 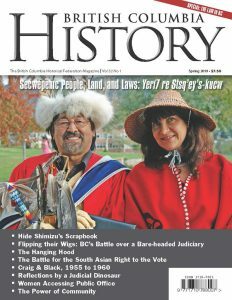 Subscribe to British Columbia History magazine — available in print or digital! Library and Archives Canada (LAC) announced the recipients of the Documentary Heritage Community Program, and twelve are from BC. On April 18, the Nanaimo Historical Society will receive an Honour in Heritage award from the City of Nanaimo.